Bill Gossman came by the other day with a pot & a problem. He knew he needed to attach a ceramic handle to a ceramic pot with copper wire, but he needed to work it through with somebody. Since I am an easy-access local wire artist, he came by the shop with a bag of wire, the pot and his first attempt. It wasn’t bad, but it wasn’t special. After talking through a few options, arguing a bit, clarifying what the other one was saying and a consult with the plumber across the street, he ended up with a terrific solution. And it was fun helping him get there. 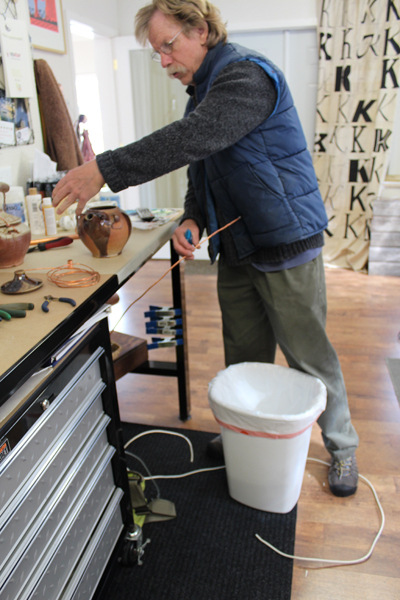 Stop by Gossman Pottery sometime and see what he ended up with. He’s just up the street.